Circa 15 cm ronde tafelsteum met 2 ronde composiet B-Kogels en 6 cm hoge klemarm. Geschikt voor montage van smartphone, GPS en tablethouders. 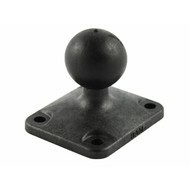 This universal desktop mount RAP-B-291-A-202U consists of a high strength composite 6 inches diameter round base, two round base plates, and a 2.36 inches arm. This free standing mount offers perfect viewing angles in both portrait and landscape. While ideally suited for a desktop, there are also mounting holes in the base for vertical surfaces if desk space is just not available. The mount is designed with a RAM 1 inch diameter patented rubber ball and socket system that has adjustment points at both ends of the double socket arm - this allowing for almost infinite adjustment and perfect viewing angles.